The JDM Machines Take Over the Annual Event in Los Angeles, Little Tokyo! A small taste of the Japanese culture can be experienced in Los Angeles at a place called Little Tokyo. Every year, a weeklong event called the “Nisei Week” is held and thousands of pounds of shaved ice and fried noodles are consumed by the show-goers. Inside this festive cultural gathering, a mob of JDM cars takes over the street to represent a car show called the Nisei Week Showoff Car Show. This event consists only of tuned Japanese vehicles, mainly with Hondas dominating in numbers. The vehicles displayed are modeled after the Japanese tuning style; from classics, spocom style (sport compact), drift machines, and VIP style vehicles. 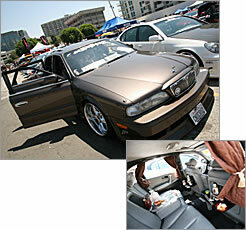 The Nisei Week Showoff is the place to be to witness some of the hottest JDM cars in the US. Let's see what Yas, our US resident editor has in store for us! New to the vehicle line up this year is the ultra fuel efficient Honda Fit. These days the automotive manufacturers are bringing out more and more compact vehicles to the American market. Although the Honda Fit was released for sale this year, this vehicle suited a right hand drive configuration. We later learned from the owner that they had imported this machine before the Fit had even hit the US market. A K20A engine lurks beneath the S2000 yellow paint strictly for track use only. The owner of the vehicle claims that the K20A swap is fairly simple due to many conversion kits available today. 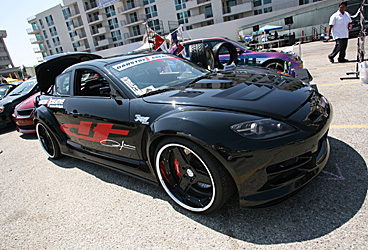 This RX-8 built by the shop Danstoy boasts an exterior that resembles that of a luxurious sports car. Deep dish Giovanna GFGs were chosen to accent the ride along with Tein suspension, and Rotora brakes. Inside, sits 4 large subwoofers in the rear and amplifiers were placed in the trunk space. Not sacrificing luxurious options such as a great audio setup is the American way of tuning. The engine is a bolt-on process, and is claimed to be relatively simple. This may be the next trend in Honda tuning. The fenders are 2.5 inches (63.5mm) wide! The new bodylines bring out a unique flavor. No room for luggage or any passengers here! The Kicker subs sit comfortably where the passengers usually sit. Danstoy is a shop well known for building custom headers for the AE86. A HKS T04Z turbine pushes over 450 horses controlled by a TECIII system. This 1994 Supra was constructed from SP Engineering, which is highly known to build spectacular rides. Everything consists of Top Secret components, giving an impression that maybe that this flawless ride was shipped out and built by Smokey himself. The suspension was combined with a Roberuta set to raise and lower the vehicle with ease. Two HKS GT3038 turbines power the 2JZGTE pumping out 820 horsepower controlled by an FCon VPRO. This machine had graced the pages of many magazines and will surely break necks if driven around town. The beautiful owner of this beautiful 2000 Celica is Lisa, pictured above. Having a slight sexist intuition, we told her to pop the hood and to our surprise, 4 individual throttle bodies were exposed. The shop Danstoy had constructed the 2ZZ engine to this specification. Another interesting part of this vehicle is the limited edition Recaro Tomcat seats, which had a serial number of 5 and 6. The interior door panels were constructed of carbon Kevlar made by Seibon. The headliner and the carpets were also constructed by carbon Kevlar. It may be a commonality in Japan, but in the US, Stack gauges mean serious business. Recaro Tomcats were chosen to hold the driver at high speed. In the trunk space, an Alpine amplifier and Boston subwoofers were tastefully mounted. The custom harness bar firmly held the 19 inch monitor in place. The 18 wheels are from JLine, called the SDM SL2. 235/40-18 9J and 255/35-18 10.5J were setup. There were all kinds of modified imports here. 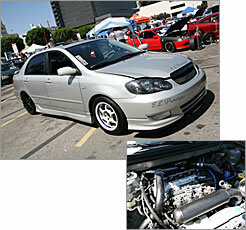 This 2003 Corolla is powered by a prototype Turbonetics T3/T4 turbo plus Toyota AE101 individual throttle bodies. Lately in the US, the VIP car styling has been increasing popularity. Although it's a bit different from Japan, the vision seems to be similar. The key feature of this Infiniti Q45 is definitely the interior. You can even enjoy a shot of Brandy while cruising. The ever-so popular EF Civic. There are plenty of these at these kinds of events, but the one pictured above is fitted with a Group A spec engine imported from Japan. Lately, whether it's a change of pace or the mimic of the Japanese tuning scene, tuned minivans and station wagons have been popping up. This Mazda Protege was fitted with an AutoExe body kit, and an IHI VF22 turbine. It's not an import car show without a Lexus IS! (Altezza) The US version came equipped with a naturally aspirated 2JZGE engine. The bottom end has been swapped with a turbo 2JZGTE and bolted to a LMS Supercharger kit good for 307 horses! This clean 240SX had been painted House of Colors green, and was built for drift. 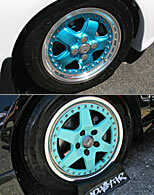 The popular JLine SDMs12 wheels were chosen with custom offset and color. Although drifting is the popular motorsport these days, the Honda boys are still going strong! The EF, EG, and EK models still rock the scene. 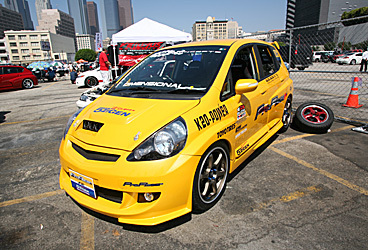 Various enthusiasts from die hard JDM guys to power hungry racers dominated the lot. Plenty of Type R engines can still be seen in these machines. This year, roof racks have been increasing its popularity. It's not that these guys really use them for its intended purposes, but some were purely for aesthetics. Is it ok to call these guys poseurs? Sneakers were seen throughout the show every so often. This urban look was intended to gather show points and enhance the theme of the vehicle. So where were the Japanese flip flop sandals? Massive front mount intercoolers separate the predator and the prey. Stenciling text onto the intercooler fins added great essence. Some even went as far as going graffiti style lettering. Custom painting the faceplates on rims seems to be the popular trend as well. The color of choice seemed to be light blue on several Hondas for some reason.